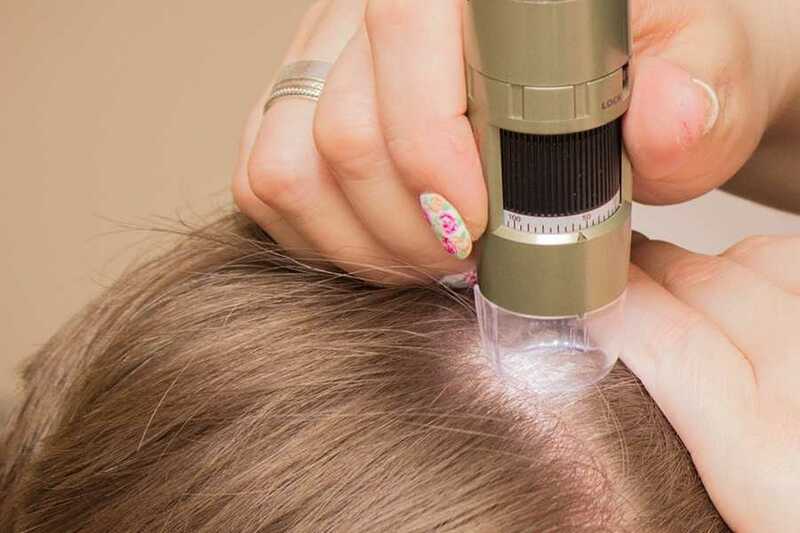 It is important for a trichologist to physically examine your hair and ask you lifestyle questions to establish scalp conditions, in order to evaluate and apply the correct cause of treatment, no matter the symptoms or worries you present with. Here, we take a look at some of the common questions and tests a trichologist will go through, in order to leave you better prepared for your first appointment. It is essential you provide your trichologist with an overview of your medical history, as a previous condition may be contributing to your hair loss or scalp condition. Family history and genetics may also have a part to play. The more information you are able to give, the easier it will be for your trichologist to establish and treat the cause of your hair loss and discomfort. Not eating a well-balanced diet can often dramatically affect hair growth and condition. A lack of vitamins, iron, zinc and folic acid will stunt hair growth. Your hair is the last point of your body to get nutrients, as your internal organs will receive the nutrients first so ensuring you have a good amount in your system means your hair will get some too! Stress is one of the most common causes of alopecia (dramatic hair loss). Letting your trichologist know of any major life events or changes will help them evaluate why you are experiencing hair loss. This is a combination of your diet, sleep habits, whether your consume alcohol or smoke. Like any health check, letting your trichologist know all the details means they can provide you with the correct treatment. Having a good hair care routine and treating your hair gently works wonders. Your trichologist needs to how you currently style your hair so that they can advise you on ways to improve your hair quality and scalp condition at home so you can help prevent damage. Blood gives a lot of information about what is going on in your body. Crucial blood tests may determine what is causing your scalp discomfort and hair loss. The blood tests look at your iron levels (including ferritin, iron stores), your red and white blood cells, minerals and vitamins, folic acid and your thyroid. Your trichologist will also occasionally run hormonal tests. Blood tests will also be performed regularly throughout your course of treatment to ensure that the medication or other treatment prescribed is working effectively. You can request blood tests from your GP, however a GP reads the tests differently to a trichologist. What appears normal and healthy to a GP, may not to a trichologist who may be able to read into the results to find out what is causing your hair loss if any common markers turn up. Your trichologist and their assistant will take time (usually around 40-50 minutes) to thoroughly examine your hair and scalp. This initial consultation helps your trichologist ascertain scalp conditions and possible irritations and analyse what may be causing your hair loss or scalp issues. Your hair can provide your trichologist with many tell-tell signs of underlying conditions contributing to hair loss. Hopefully now you should be better prepared for your first visit to a trichologist. Here at the Wimpole Clinic, we’re always on hand to answer patient’s questions, so why not call to book your first appointment with our experienced professionals today?